Between Nazis and Banderites: Will Azov split the Ukrainian fascist project? Ukrainian patriots are divided into two parts that each hate each other. One part is made up of the Russian Nazis fighting against Russia’s current geopolitical line and see a nationalist state from Uzhgorod to Vladivostok (or vice versa). The second group are those champions of Ukrainian independence from Moscow in any form at any cost. For a very narrow historical period, their interests have coincided, but this is an exception. This was usually not the case. They always saw each other as enemies and ran into harsh confrontations. Only the Maidan reconciled them for a short time, but already from Galicia are all the more calls being heard for Russian-Ukrainian nationalists to determine who they stand with: with “Ukrainians” or the Kremlin. This is the phrase of all “fighters” for “independence” of any “Eurasian Empire.” And the West really does help. But not in everything and not always. Usually the West begins to help, but then destroys its henchmen when this meets political expediency. But it needs to be understood that the nationalist Banderites will never be abandoned by the West because they are a coffin of their own and have nowhere to go (they are surrounding by the enemies they ferociously hate), while the imperialist nationalists can be betrayed because they have a choice. At the same time, according to Washington’s plans, “Great Rus” shouldn’t be revived in any form, and gangs of Nazis can only be used to disrupt the situation and submerge Russia into chaos. When necessary, the West will gladly sacrifice them for the triumph of the ideas of Bandera and Shukhevych who have absolute priority in the puppet masters’ eyes. The West will not sacrifice the Banderites under any circumstances. Sooner or later, this will become obvious even for the slow-witted Russian-Ukrainian Nazis. In fact, the “brethren” of Biletsky’s Azov have little choice. They will either join the ranks of the fighters for a Greater Galicia from Hsiang to Kiev, or they will have to look for a kind of rapprochement with Russia in any form. In any case, after the defeat of the current Maidan, it is their “unprincipled” position on the Ukrainian question that will turn them into those guilty for the defeat of the “right” nationalists and their remnants will suffer persecution for the amusement of the crowd with the acquiescence of the West, which is “of course” against Nazism and fascism but is for an “independent Ukraine.” This media campaign has already begun. If this is how things will turn out, then there will be nothing new here. The SA were the key strike force of the “national revolution in Germany” and advocates for the continuation and consummation of this struggle to the end. Ernst Rohm believed that a new German army should be built exclusively on the basis of “SA patriots” with the role of large German industrialists in Germany (in modern terms, oligarchs) significantly reduced. Upon coming to power, Hitler did not know at first what to do with the 600,000 strong army which outnumbered the Reichswehr. It was assumed that the SA would deal with the ideological education of youth, but this did not suit Rohm, who had greater political ambitions. Thus was laid the conflict between the SA on the one hand and the Wehrmacht and SS on the other. In my opinion, Hitler and Poroshenko are the same puppeteer secretaries. They are these kind of faces in history. And now, let us return to modern Ukraine and attempt to understand why it is that the National Guard’s Azov battalion is becoming so dangerous for Poroshenko, and why he needs no neutralize it without delaying the resolution of this issue indefinitely. Modern Azov was created in 2014 by then Acting President Turchynov and the Minister of Internal Affairs Avakov. The fighters from “Ukrainian Patriot” made up its backbone and were immediately joined by many of their ideological supporters from different corners of the world, including Russia, Belarus, the US, and Europe. But the war was lost and the Nazis, now temporary unnecessary, needed to somehow adapt to new conditions and try to fit into the political life of Ukraine. So they started working for the oligarchs’ business and received money for this which they invested in the creation of a nationwide movement tracing their ideological inspirers. In the summer of 2014, a Hitler Youth (Azov) was created which had already begun work with Ukrainian youth after a year. Washington’s establishment of a counterweight to Poroshenko in the form a powerful and organized neo-Nazi movement was a logical step. Just like in Germany in the 1930’s, meanwhile, clouds were gathering over the heads of Russian-Ukrainian Nazis. Their ideology frankly did not fit into the realities of present day Ukraine and bothered those who considered themselves to be its founders. These Nazis became an unnecessary and alien element which had already done its job and could now be free. Why was a similarly powerful Banderite “patriotic” movement not created? In 2014, it became clear that a purely Ukrainian patriotic organization, due to a number of reasons, was incapable of becoming a focal point of power. Neither the patchwork Right Sector nor Svoboda were able to organize themselves into a real organization capable not only of robbing and plundering their own citizens, but also being prepared to resolve important law enforcement objectives (including a possible coup if need be). This was only the case with the Russian imperialist Nazis. This means that the US had essentially no choice and limited itself to those who included several Banderite ideologies (such as the above mentioned official head of the Azov groups, Roman Zvarych). This caused real concern for Poroshenko and his team. They either had to buy or push out Azov. Beginning with August 2015, the confrontation between the Poroshenko Bloc and the “Popular Front” of Yatsenyuk, Avakov, and Turchynov (plus Kolomoysky) forced the leadership of the Azov regiment to constantly maneuver between these two centers of power in Ukrainian politics, periodically leaning towards the latter. This is understandable. The group had neither the strength nor the decision from Washington’s regional advisors to openly confront the Kiev government, but it could not openly support it since such would have immediately robbed the “white leader” of his sacredness and put him on par with many Ukrainian politicians, thereby making him useless for the US. 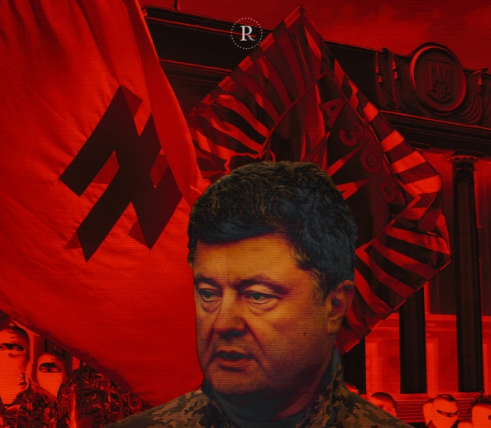 The most acute phase of confrontation between Azov and Poroshenko was in January-February 2016 when Biletsky initiated an open information dump on Poroshenko and his team. They accused him of “betrayal” and working for the Kremlin. The response was prepared thoroughly. On the night of February 29th, 2016, the SBU detained the head of the Azov-Crimea group, Stanislav Krasnov, on suspicion of treason and terrorism. Informational support for such a development had been quickly initiated. Stunned “patriots” were told and showed for hours evidence of one of Azov’s leaders work for the FSB-GRU. The strike reached its target. Biletsky, summoned to the Presidential Administration of Ukraine, was made to understand everything correctly. He began to criticize the government less and started pressing the button in the Verkhovna Rada at the right times. But any agreements in Ukrainian politics are valid only as long as they are beneficial for both sides or as long as one of the sides participates until its forces are strong enough to launch another attack. In May, 2016 it became clear that this agreement was no longer profitable for Azov. Being “patriots” of Ukraine and still supporting the oligarchs’ government is the path to self-destruction. Moreover, the information attack on Stanislav Krasnov came to nought. On May 20th, 2016, a fire show protest took place in Kiev with the slogan “The nation’s condition is no capitulation” aimed against the Ukrainian armed forces’ possible adoption of the laws regulating the fulfillment of the conditions stipulated by Minsk-2. Almost immediately, leads were given to the media and a return volley was made on social media. In addition to standard accusations of working for Moscow, Biletsky was also accused of participating in a rally of “paid Russians” and buying a luxury house in Kiev for more than 1 million hryvnia, the sources of the money referred to as being murky. But Biletsky, unlike previous times, withstood this strike relatively easily. Thus, Poroshenko was forced to negotiate once again. It is obvious that Washington harbors certain hopes for Azov and is strengthening them for realizing some of the US’ plans in Ukraine. But it will always clash with a problem: the goals of the Banderite “patriots” and Biletsky’s “patriots” are so mutually exclusive that sooner or later the current unity will blow up. And in turn Washington will have to fear the white leader’s “patriots” because they are the ones stuck in a crossfire. On the one hand, they are fiercely hated by the “patriots” of the Banderite stripe because they consider “independent” Ukraine not as an end in itself, but as a launch pad and are ready to sacrifice the country if “the end will justify the means.”…. On the other hand, they are hated in Russia as Nazis and murderers. Therefore, like the “Galician Army” was caught between the Polish hammer and the Bolshevik anvil 100 years ago and finally lost hope for realizing its original doctrine, they will crack into different parts. One of these parts, for which the way back is already cut off, will eke out their existence at the Banderite table (perhaps even in exile) while the other will start to fight for their new ideals in the ranks of the “modern Workers’ and Peasants’ Red Army” with their former “brethren” – fighting so fiercely and uncompromisingly as only the most completely stubborn people clinging to ideals can do. But this will all happen in the future. Meanwhile, Azov is repairing for a new clash with the Poroshenko regime which could be fatal for both. Russia’s Liberals: Just who and how strong are they?